Salix pedicellaris Pursh, Fl. Am. Sept. 6n. 1814. S. myrtilloides pedicillaris Anders. Vet. Acad. Handl. 6': 96. 1867. An erect slender glabrous shrub, l°-3° high, the twigs light brown, terete. Leaves linear-oblong, elliptic-oblanceolate or obovate, obtuse or acute at the apex, entire, mostly narrowed at the base, I'-3' long, 3"-8" wide, short-petioled, bright green above, pale or glaucous beneath, their margins slightly rcvolute; aments expanding with the leaves, leafy at the base, rather dense, 1' or less long, or the pistillate longer in fruit; bracts persistent, obtuse, slightly villous; stamens 2; filaments glabrous; style shorter than or equalling the stigmas; gland short; capsule oblong-conic, obtuse, glabrous, 2 1/2" long, 2-3 times as long as the filiform pedicel which slightly exceeds the scale. In bogs, New Brunswick and Quebec to British Columbia, New Jersey, Pennsylvania, Ohio and Iowa. April-May. Has been confused with the similar S. myrtilloides L., of Europe. Salix fuscescens Anders., occurring on Mt. Albert, Quebec, in Alaska, and in western Siberia, differs in a shorter pedicel and longer-pointed gland, the capsule glabrous or loosely pubescent. 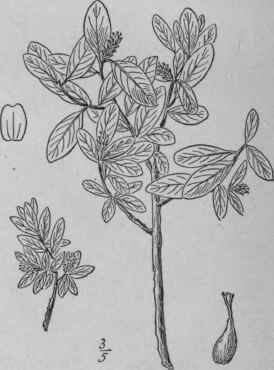 S. chlorolepis Fernald, Rhodora 7. 186. 1905. A shrub, 30 high or less, the branches smooth, nearly erect. Leaves oblong to oblong-obovate, entire, mostly obtuse at the apex, narrowed or rounded at the base, 5"-12" long, 3"-5" wide, slightly pubescent when young, glabrous when mature, pale beneath, the petioles 2"-7" long, the stipules deciduous; aments on short leafy branches, 7" long or less, 2"-3" thick; bracts oblong to obovate, glabrous, green, subtruncate, about 1 1/2" long; filaments glabrous; capsule conic, glabrous, very short-pedicelled, 2" long; style slender, twice as long as the stigmas. On rocks and in alpine meadows, Mount Albert, Quebec. Salix calcicola Fernald & Wiegand, another recently described boreal species with glabrous capsules and long styles, has large terminal and lateral catkins and nearly orbicular leaves; pale beneath. 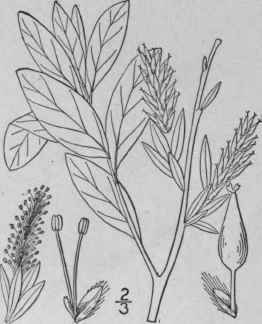 Salix reticulata L. Sp. PI. 1018. 1753. Salix orbicularis Anders, in DC. Prodr. 162: 300. 1868. 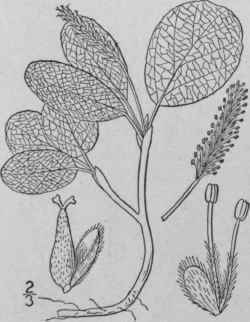 A procumbent shrub, 3-10 high, often sending out roots from the twigs, the young shoots 4-sided, purple-green. Leaves elliptic or obovate, thick, obtuse, narrowed, rounded or subcordate at the base, slender-petioled, glabrous or somewhat silky-pubescent when young, dark green above, not shining, glaucous and strongly reticulate-veined beneath, 1'-2' long; petioles 4 -12" long, channeled, not glandular; leaves obscurely crenulate or entire; stipules oblong, obtuse; aments terminal, long-stalked, dense; bracts obtuse; stamens 2; filaments distinct, pubescent at the base; stigmas sessile; capsule ovoid-conic, sessile, tomentose, about 3" long. Labrador and Quebec to Alaska, south in the Rocky Mountains to Colorado. Also in northern Europe and Asia. Wrinkled-leaf willow. June.